On his latest album, pianist Timothy Crane has one speed (mostly) and that is full throttle. The Fall Of A Sparrow is not “ideal for late night relaxing,” in fact, quite the opposite. Hit the open road, maybe in a convertible, head for rolling hills and winding curves, insert CD, turn up the volume, and luxuriate in the drama, power, joyfulness, and orchestral oomph of this high energy, quite tuneful, and well-produced recording. The combination of an exhilarating drive will mesh with the equally exhilarating music and all you will have to worry about is your speedometer ending up well north of the posted limit. Yeah, this is one of those crank ‘er up and let ‘er fly albums. One that will make your heart race and a smile break out on your face. There are some quieter moments on the album, but never has the term “quieter” been meant more relatively. Stylistically, I consider Crane to be similar to Yanni (not his earlier electronic period, but his mid and later period releases). It’s not just the orchestral nature of Crane’s music here, but the overall dramatic arc and the mixture of optimism and romance. One can also draw similarities to Wayne Gratz at his more exuberant, e.g. I am thinking of Gratz’s earlier releases such as Follow Me Home and Blue Ridge. Yet, Crane never comes across as imitative; this is his music and his alone. It’s possible that either of the two artists I just mentioned perhaps are influences to Crane’s composing and performing, which would his great taste in influences as far as I’m concerned! Besides Crane’s piano and his well-executed keyboard orchestral arrangements, there are several guest artists sprinkled among the fifteen tracks (see above). Of note, three of those fifteen tracks are reworked versions from earlier Crane albums (Dragonfly, Piaonforte, and The Other Life I Dream). While a lot of the music on The Fall Of A Sparrow is uptempo and energetic, as mentioned earlier there are a few quieter passages or moments, such as the lovely yet sad “Star Cross Moon” (this track was also on Dragonfly), which is, more or less, a duet between Crane and violist Daniel Coffey. The mood is plaintive and evokes mournful remembrance at times, while also flowing with grace and beauty at others. One of the elements that truly stand out on this album is how adept Crane is at composing catchy refrains for his songs and this is a quality he clearly shares with Gratz. The closing “At Home In The Garden” is a great example, as his piano runs are accompanied by subtle hand percussion and some delightful sparse orchestral additions. The opening track, “Albion,” is another winner as it comes bursting out of the gate with bravado and joy, with the orchestral strings being plucked and then short-bowed. That sets the listener up for the celebratory “Come Holy Spirit,” which follows next. The song’s first passage is a quiet and brief followed by a wonderful (and catchy) piano melody. The full orchestra folds into the piece shortly after its introduction. As I write this review and listen to this particular track, another artist comparison that comes to me is to an under-appreciated “one hit wonder” pianist from the late ‘90s, David Friedman and his album, Moonrise. Both Friedman and Crane really know how to not just integrate orchestral elements into rousing keyboards but they also have superb base sounds to work from as well. Crane really has homed in on perfection when it comes to applying not just the right amount of orchestration but the quality of same and which sections of the orchestra to call to action and also when. First rate stuff and not at all easy to pull off (trust me, many others don’t have anywhere near his talent at this). 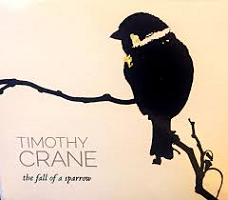 The more I listened to The Fall Of A Sparrow, the more I (a) enjoyed it and (b) appreciated the attention to detail Crane and mastering engineer Steve Sundberg paid to the music and finally (c) the composing talent of this artist. If this album doesn’t break Timothy Crane to a much broader audience, I don’t know what else the poor guy has to do!